The stylish contemporary Harmony toilet, comes complete with a soft close seat. The Harmony range is designed and manufactured by leading bathroom brand Premier. This product features a dual flush cistern for improved water consumption. Q. Can you have a soil pipe exit from the left or right side?? Hi, this product is designed for a horizontal waste. Thank you for your message, hope this helps! 2 out of 9 found this question helpful. Q. You say it is dual flush 6 litres. Is the smaller flush 2 or3 litres? Hi, the smaller flush is 3ltrs. Thanks. Hi, yes an ideal replacement seat for the Premier Harmony Close Coupled Toilet is the Premier Luxury D-Shape Soft-Close Seat with Square Edge (product no: NTS007). Hope this helps. 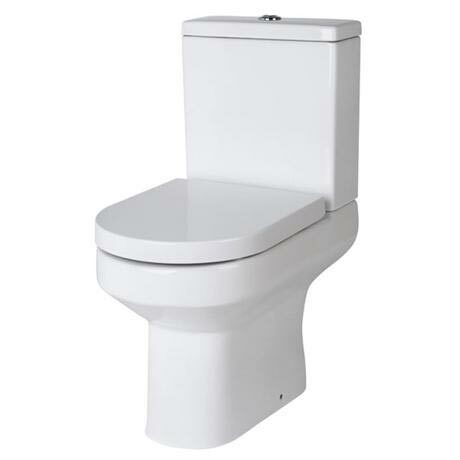 Q. what fittings do i need to install this toilet & are they a standerd size that can be purchased from anywhere? Hi Nicky, the fittings and instructions needed for the Premier Harmony Close Coupled Toilet are included. Thanks. I am really pleased with this item - it looks really nice, and I can't wait to have it installed. Like another customer, it was missing the 'included' toilet seat. Numerous emails got me nowhere, and only when contacting them via Twitter did I manage to get a response and the seat sent out. Really pleased with the product, I did do quite a bit of research prior and I'm hoping it has paid off, certainly cheaper than other sites where I have seen this at £60 more including discount and delivery! Arrived on the 3rd delivery and everything appears in tact, as the toilet won't be fitted for a couple of weeks I cannot say for definite whether anything is missing (fingers crossed there won't be). However, packaged very well and would be surprised if anything was damaged in transit. Only area which could be improved is with the courier, would have helped if they sent an SMS message giving approximate timings rather than having to wait in all day. Also, no toilet seat but I have called Customer Services to report this and hopefully it will arrive in time before fitting.All in all, my first order with Victoria Plumbing and this proved to be a positive experience thus far.